Annisquam Herb Farm: Spearmint . . . When you want a warm drink try spearmint. Harvest a large handful of the best spearmint. Put into a saucepan and cover with 2-3 cups of water. Bring to a boil. Remove from the heat. Cover with a tight lid and let steep 20 minutes. Pour tea into a favorite cup and take a few minutes to relax. Spearmint (Mentha spicata) has a minty, slightly fruity scent, softer than peppermint. A rich antioxidant, traditionally spearmint oil has been used to help support the respiratory and nervous systems. Its fragrant influence may help open and release emotional blocks and bring a feeling of balance and a sense of well being. Spearmint contains limonene which has been shown to be antiviral and in may stimulate the secretion of antibodies, neurotransmitters, endorphins, hormones and enzymes. 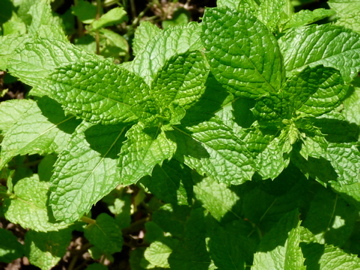 An oil infused with spearmint can be used as a massage oil.